The Theatre Royal’s production centre TR2 has just completed a very unusual commission for the new Spice Girls musical, Viva Forever! 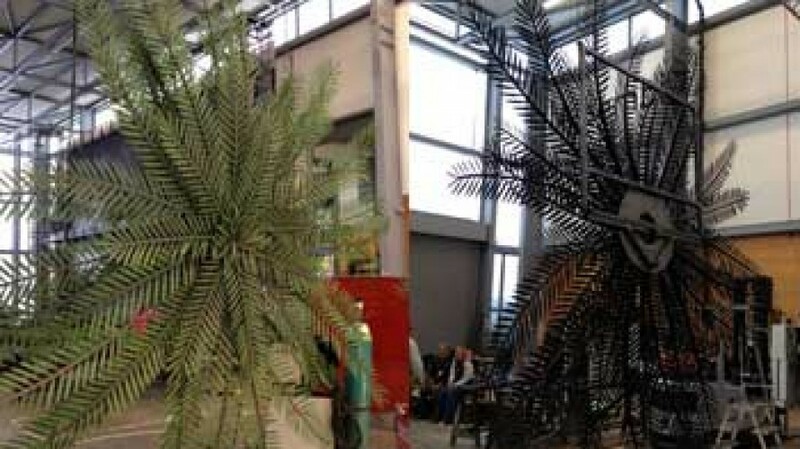 TR2 was asked to make the tops of palm trees, which will hang from the back of the set. The TR2 workshop staff had to create 6 in total, with each one measuring 4 metres across and weighing 150kg (over 23 and a half stone). The palm fronds were made out of laser cut steel and welded together before each leaf was individually curled and painted to give them more texture and colour. It took 7 people 3 weeks to make the palms, which included working out how to transport the palms – although they are made of steel, the fronds are very delicate so the palms can’t be lifted by picking them up around the edge. To get around this, the palms were made in two halves so that the top half could be attached to the fly system first and lifted a little way off the ground. The second half can then be placed underneath and will lock itself in, meaning the whole palm can then be lifted further up and into place using the fly system. Viva Forever! will open on Tuesday 11 December at the Piccadilly Theatre in London’s West End.